A recent development has provided a rare ray of hope: the extraordinary mobilisation of Congolese civil society in defence of the DRC’s nascent democratic institutions. No fewer than 210 Congolese non-governmental organisations, including those enjoying the widest recognition and respect across the country, recently joined in challenging President Joseph Kabila’s attempt to take control of the National Assembly (the lower house of Parliament) that came into office after historic elections in 2006. The episode that brought together Congolese civil society was Kabila’s insistence in March on forcing the resignation of Vital Kamerhe, the Speaker of the National Assembly. Kamerhe had antagonised Kabila by criticising his secret deal with President Paul Kagame of Rwanda that resulted in joint military operations earlier in the year against a Rwandan rebel force operating in the DRC. And yes, this comes from The Namibian, South West Africa's paper of record. CR trawls widely to bring you news you can use! Speaking of which, the Missionary International Service News Agency reports that FDLR rebels set at least 30 homes on fire last night in Miriki, in North Kivu. "According to local witnesses, the attack took place in the middle of the night, causing panic among residents that fled into the forest. Miriki, 120km north of the provincial capital Goma, was for long a stronghold of the FDLR that extorted tributes from residents in absence of a security force." 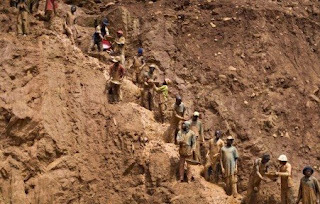 Congratulations to Finbarr O'Reilly for receiving the best photography award from Diageo for his work on artisinal gold mining in the DRC. He was one of several journalists recognized by Diageo for their reporting on African business. Story here. Is that hope in your pocket or are you just happy to see me? Jenna Dewan and Emmanuelle Chriqui were among the many lovely young things attending a bash at Hollywood's Jane House a few days ago, organized by our friends at Enough. This seems to have had something to do with raising hope for the Congo. "There is no excuse for missing to pay salaries to soldiers in lawless eastern Congo for six months"
Following the deteriorating situation in east Congo, the MJPC called today for the Congolese Government to urgently pay the salaries to thousands of soldiers who have not been paid for over six months in eastern Congo, take swift action to enforce the International Criminal Court's (ICC) warrant against Bosco Ntaganda and to hold accountable perpetrators of sexual violence against women for their acts. "Failing to hold accountable individuals who commit war crimes and crimes against humunity continues to be the leading cause of widespread and systematic sexual violence acts against girls and women in the easten Congo" said Makuba Sekombo, Community Affairs Director of the Mobilization for Justice and Peace in the DR Congo (MJPC). Mr. Sekombo again criticized the government of Congo for not only the continuing failure to protect women and young girls from sexual violence, but also for "encouraging conditions that create opportunities for sexual violence to occur". "There is no excuse for missing to pay salaries to soldiers in the lawless eastern Congo for six months" said Sekombo. The MJPC has also renewed its call for the Congolese government to take urgent needed action to end human rights abuses in east Congo, hold perpetrators accountable and ensure reparation for the victims of sexual violence.